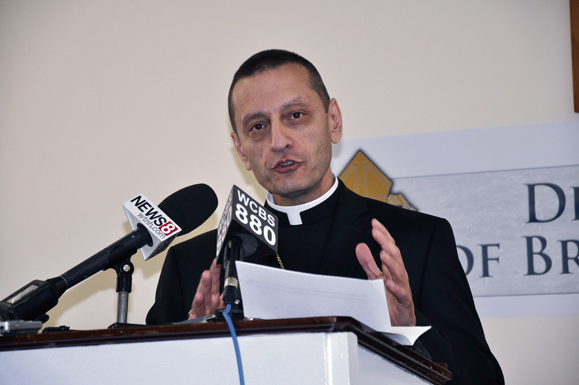 Bishop Frank Caggiano, Auxiliary Bishop of Brooklyn since 2006, addresses the media at a press conference in Bridgeport, Conn., after being named the new bishop of that diocese. The bishop, who has served in the Brooklyn Diocese as vicar general and auxiliary bishop since 2006, met the press in Bridgeport’s Catholic Center July 31, the day he was appointed as the fifth bishop of the diocese. The appointment was announced in Washington, D.C., by Archbishop Carlo Maria Vigano, apostolic nuncio to the U.S.
Bishop Caggiano, 54, succeeds then-Bishop William E. Lori of Baltimore, who was named archbishop of Baltimore in March, 2012. Msgr. Jerald A. Doyle has been an administrator of the diocese since May, 2012, and he will continue to serve in the post until Bishop Caggiano is installed. The installation has been scheduled for Sept. 19 at a yet-to-be-determined site. The date is the Feast of St. Gennaro, patron of his ancestral home in Italy, as well as his late mother’s birth date. “There are always challenges in such ministry, but I have every confidence that the Lord always provides us whatever we need to meet those challenges and through the struggles we share to deepen our faith and love for him and one another,” he added. On a personal note, the diocese learned its new bishop is an avid New York Mets fan and enjoys gardening, reading and carpentry work. Msgr. Doyle said in a statement that Bishop Caggiano’s appointment was welcome news. “The Holy Father has blessed us with a priest, pastor and teacher with extensive experience at every level of diocesan ministries,” he said. “Most importantly, he is a man of deep faith, love for the Church and commitment to the Gospel. On behalf of the clergy, religious and laity, we welcome him with open arms and with our prayers that God will bless him as the shepherd of our diocese,” the priest said. Ordained a priest in 1987 for the Diocese of Brooklyn, Bishop Caggiano has served in a number of pastoral and administrative positions. He has been both a pastor (St. Dominic’s, Bensonhurst) and also responsible for the formation of men for the permanent diaconate. In 2006, Bishop Caggiano was named an auxiliary bishop for Brooklyn and since then has served as vicar general and moderator of the curia. Bishop Caggiano was born in the Gravesend neighborhood of Brooklyn on March 29, 1959. He holds a bachelor of arts degree in philosophy from Cathedral College, Douglaston; a master of divinity from Immaculate Conception Seminary, Huntington, L.I. ; and a licentiate and doctorate in theology from Rome’s Pontifical Gregorian University. Before beginning his studies for the priesthood, he studied for a year at Yale University in New Haven, Conn., and worked for a year and a half for a book publisher. The Bridgeport Diocese covers a 633-square-mile area. Out of a total population of about 926,000, close to 411,000 people, or 44 percent, are Catholic. Jesuit Father Jeffrey P. von Arx, president of Fairfield University, in the Bridgeport Diocese, congratulated Bishop Caggiano on his appointment. He noted the bishop’s Jesuit education, as a graduate of Regis H.S. in Manhattan and the Jesuit-founded Pontifical Gregorian University. 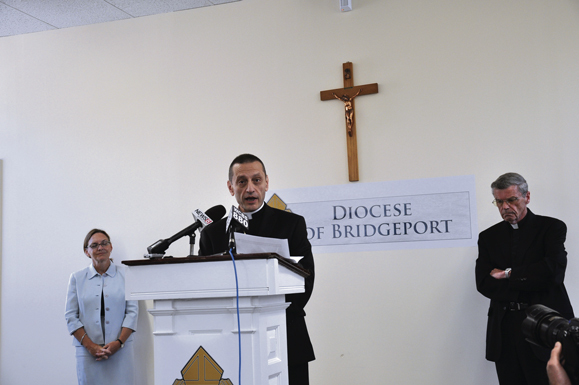 Bishop Caggiano speaks to the press in Bridgeport while Msgr. Jerald Doyle, apostolic administrator, and Anne O. McCrory, Esq., Chancellor, look on.